If Galaxy Tab 10.1 is too big for you, Samsung is offering 8.9 inch Galaxy Tab and believe it or not, that one inch makes a world of difference in terms of portability. It is small and powerful and screams the word ‘performance’, thanks to its powerful 1.2GHz dual core processor. Read the full review to find more about it. Build quality is excellent and we expect nothing less from Samsung. Bezel is of same size as that of iPad but the screen is a bit more glossy. On the top, you will find power and volume rocker buttons. There is also a front camera which is fine for doing Skype calls. 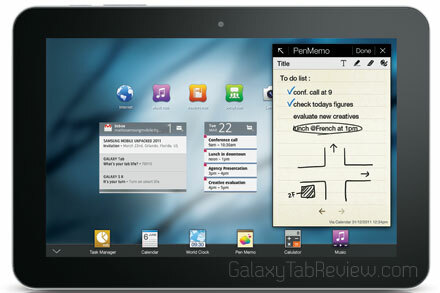 However, it has less ports compared to the original Galaxy Tab P1000. There are no HDMI or USB ports on it. Unlike iPad whose default orientation is portrait, Galaxy Tab 8.9 defaults to landscape. That said, its size and weight is perfect for using it with one hand. It is about 150 grams lighter than iPad – weighs in at 447 grams. Amazing engineering. Despite the fact that it has smaller screen than iPad, it packs more pixels. What does this means for the normal user? Well, it means that you will be able to see more at a time compared to the iPad. Text will look crisper too. The screen, as expected, support multi touch gestures too. All of them are smooth, responsive and accurate. Galaxy Tab 8.9 runs Honeycomb 3.1 operating system with Samsung’s TouchWiz UI on top which has some ICS (ice cream sandwich) like features (such as resizable widgets, multitasking list and so on). There are 5 home screens to choose from and you swipe left or right to move between them. There are two cameras (3MP on rear, 2MP on front) on the tablet – both of which are much better than iPad. I really wish there was an LED light in the front as I think we will be using the front one more, especially during video chats. There is one at the back but I never used it. Battery life is pretty amazing. I was easily able to get 7-8 hours of continuous runtime. Check out the tutorial on how to root galaxy tab 8.9 tablet. 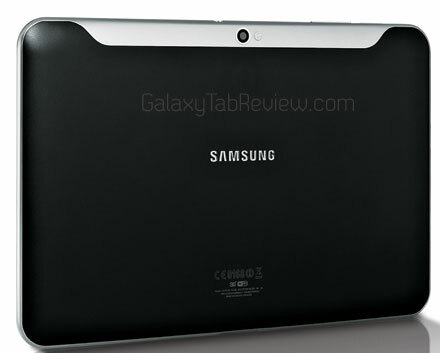 Final Verdict – Galaxy Tab 8.9 is one solid product. It runs everything and anything extremely fast without feeling too big or small. It is big enough for editing spreadsheets and watching movies and is small enough to carry around easily – certainly easier than Galaxy Tab 10.1. The only thing not to like about it is the lack of HDMI port which might bother quite a lot of people. It does not bothers me though and that is why I bought one. I rate it 5/5. Yes, I love it that much.